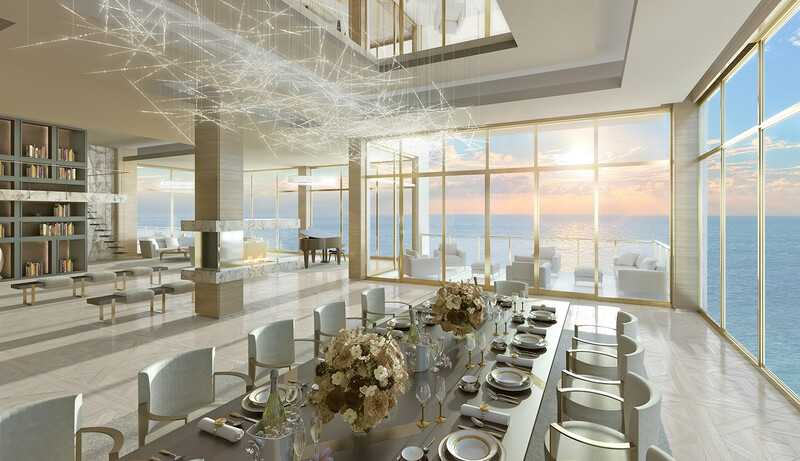 Located in Sunny Isles, overlooking the pristine Atlantic ocean is the Mansions at Acqualina. Here, your mansions rise in the sky. Choose from three floor plans, designed by a world class team of architects, interior designers, and craftsman. Top of the line finishes and materials throughout each penthouse give an elegant, yet modern touch. Balconies and terraces over look the ocean and/or the bay, giving the ultimate experience of South Florida living. Inspired by the Acquilina Resort and Spa, these sky high homes include all of the amenities and hospitality one would receive at a luxury resort, such as concierge and 24 hour valet. Of course, the Mansions at Acqualina could not be in more of a perfect location, located on Collins Avenue minutes from South Beach. Live the extravagant lifestyle you've always dreamed of. Contact a Distinct Estates agent or visit our website at Distict Estates Luxury for a list of Mansions at Acqualina condos or other Sunny Isles homes for sale or lease.